How special we thought, a first for us! All packed, we were ready to drive through the fog to Baltimore for an out-of-town, extended-family wedding. 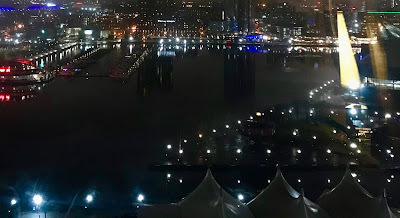 Unfortunately, the fog followed us to Baltimore but we did not allow that to dampen our mood. 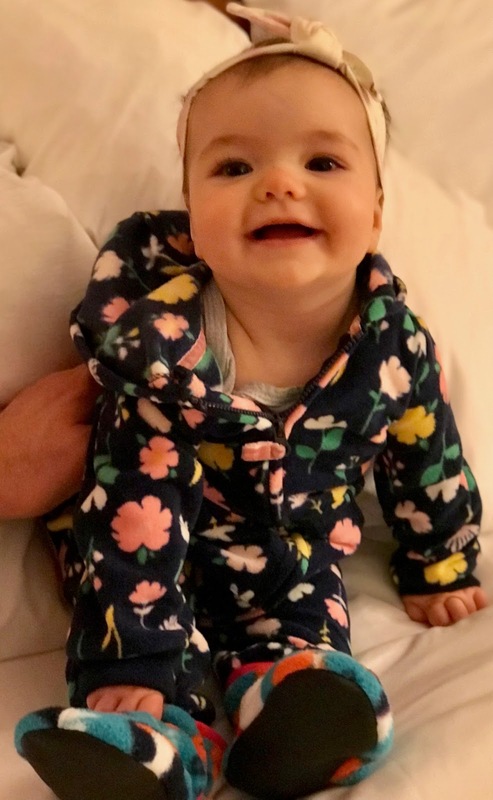 We were happy to have arrived safely and looked forward to seeing our grandbaby, Sierra. First, I needed to get adjoining rooms for our daughter, son-in-law, and baby Sierra and my family. It took a long-winded conversation to accomplish this but once the request was in place, we began the process of unpacking and rearranging the rooms. We needed to leave plenty of space for the baby paraphernalia to arrive. Little did we know that my daughter would be delayed due to DC traffic. The clock was ticking. My daughter needed to get ready for the rehearsal dinner and meet my son-in-law who was the best man. My husband, son, and I needed to take care of the baby so everyone was put on standby. My husband and son settled into our room while I started arranging the furniture in my daughter's room so the play and pack would have its own spot. Even the bellman was waiting for the car to pull up to the hotel. When the text came, my family and bellman rushed to meet in the lobby but the car was not there. Tension mounted. We waited for what seemed a long time. Then, the car pulled up and the busyness began. The bell man quickly began unloading the endless amount of baggage and I hurried to check on Sierra. Believe it or not, after two and half hours of travel Sierra was smiling. 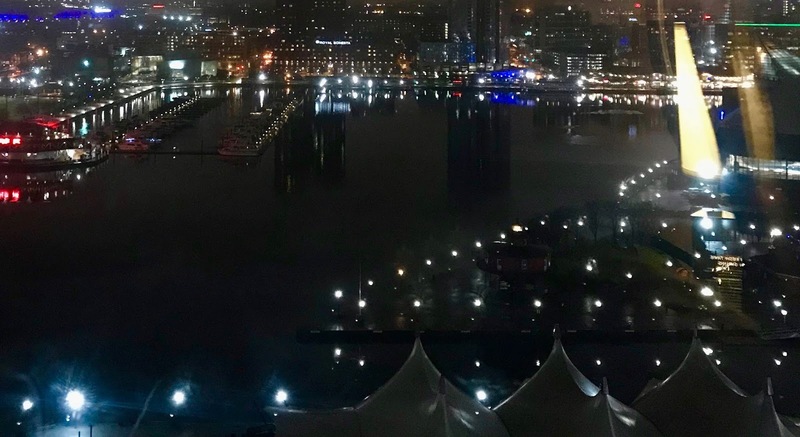 In fact her smile radiated so a chain of smiles were seen by all as we traveled upstairs to our rooms overlooking Baltimore harbor. Unfortunately, the fog was so thick we could not appreciate the beauty of the nighttime sight until the next day. For the time being, we were content and delighted to play with Sierra and get ready for her nighttime routine. The night turned out to be a joyous first babysitting venture that I will never forget. In fact, the whole weekend was filled with many life living moments! 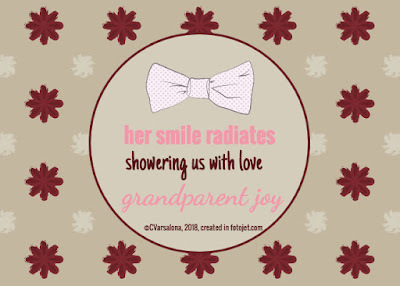 Thanks Two Writing Teachers for the space to write my slice about my "grandmother" life and share it with a community of writers. 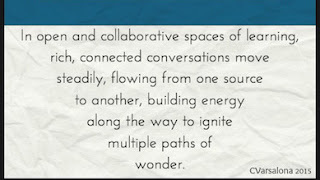 As a connected educator, I celebrate community. I honor all aspects of it. 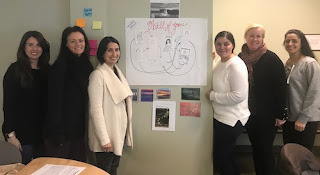 From online Twitter chats to written word to face-to-face communications, I feel the joy of being a member of a thriving tribe of passionate colleagues. What powers this feeling? Perhaps, the gifts I receive and the contributions I make that fuel my joy. I receive new knowledge, collegial support, and inspiration and in turn, offer positivity, creativity, and engaging opportunities to share voice. It is a win-win situation in which I can retain my individuality while being part of a greater whole. Communities foster togetherness, as noted by the new hashtag, #bettertogether2018, and honor all members. From isolated voices to a collective chorus, community members move within a trusting culture toward risk-taking, difference making, and growth as unique individuals with heart. 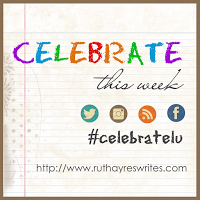 This week, I celebrate community, those I write, converse, and chat with on a daily basis. I honor the mentors, colleagues, writers, poets, and leaders in my community that have helped me develop my skills as one voice among many. As you can see my communities provide me with a range of topics to become a better practitioner of life. Within these communities, I push myself out from comfort zones, moving me toward becoming a risk taker of thought and actions. It is within communities that I grow as an authentic human open to feedback to move forward. It is also the place where I encourage others to enter. There are many more communities that I belong to in life beyond the ones mentioned. Family and friend communities are vital to my well-being and growth as well as my professional communities. When I reflect on all of my communities that I belong to, I am grateful for being part of such a vast array of personal and professional communities where collaboration counts. 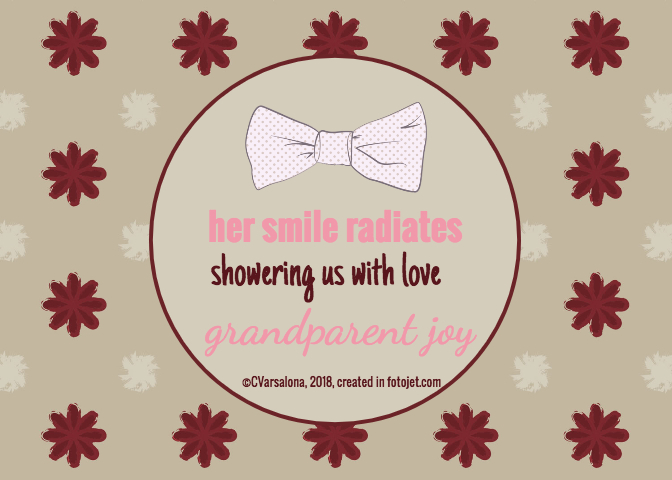 This post is dedicated to one of my writing communities that fosters a sense of positivity while reminding me that writing about my weekly celebrations are important. Thank you to Ruth Ayres for creating a space, Celebrate This Week, for sharing weekly moments and thoughts. This message honoring my one word for 2018 came from a member of my Poetry Friday community, Mary Lee Hahn. I pass it on to all as a reminder for 2018. "He who marvels at the beauty of the world in summer will find equal cause for wonder and admiration in winter." Summer seems but a distant memory now that January winter winds have blown in and brought snow with below freezing temperatures. 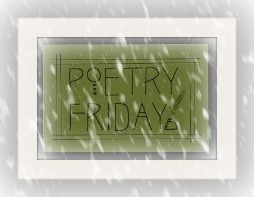 A flurry of poems have risen, just in time for the Poetry Friday Winter Roundup. I am delighted to host this event and plan to celebrate and respond to each linkup that will be offered. For those wishing to add their poetic thoughts/blog post, please see the Mr. Linky connection at the bottom of this post. Are you ready for a winter challenge? This morning, I sent out an invitation for my newest, seasonal, global gallery of artistic expressions, Winter Wonderland. Poet friends, photographers, artists, students, wonderers, and nature and/or poetry lovers are cordially invited to create alongside me and send their voices throughout social media. Some offerings have already been placed on Twitter at my repository #WinterWonderland18 . 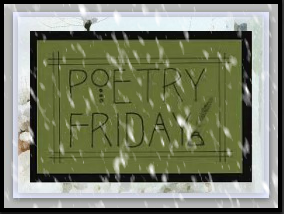 From the Poetry Friday community of writers, you will find image poems that were posted early by Linda Baie, Ramona Behnke, Leigh Anne Eck, Matt Forrest Esenwine, Jone MacCulloch, Margaret Simon, and Elizabeth Steinglass. I look forward to receiving many more to inspire others to create their own digital perspectives of winter. 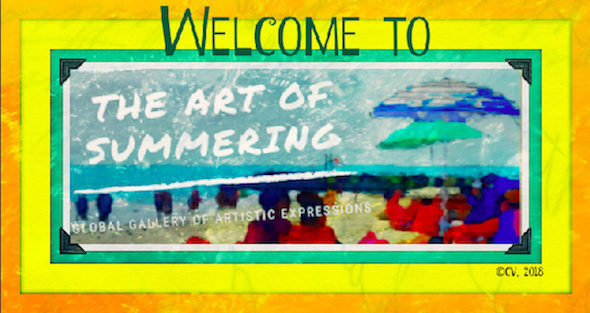 A new addition to the gallery will be the creation of a Buncee by those who wish to use the free site. There is an amazing feature to use, animation. 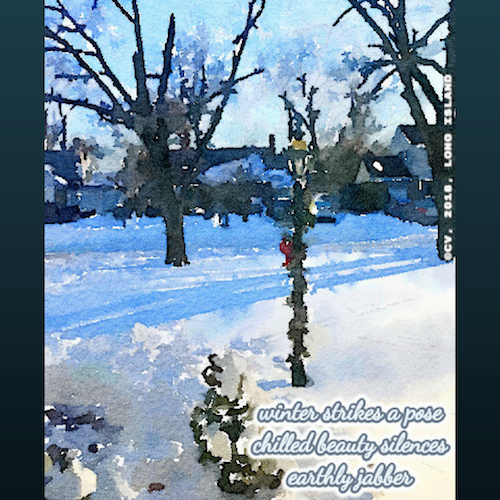 I added moving snow to the above image poem but you will need to view it here. 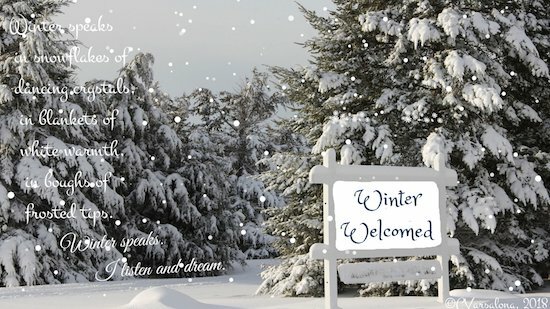 Poetry Friday writer, Christie Wyman, was the first to create an animated winter Buncee and I was so intrigued that I designed two, the one above and an animated inspirational poster for elementary children below that. 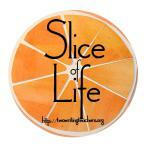 Perhaps, you would like to share it with your students or children and create one too. See the Buncee here. Christie is working with her kinders on winter poetry so their work can be showcased at the gallery. You may want to travel over to Buncee to check out their site and sign up for a tutorial. 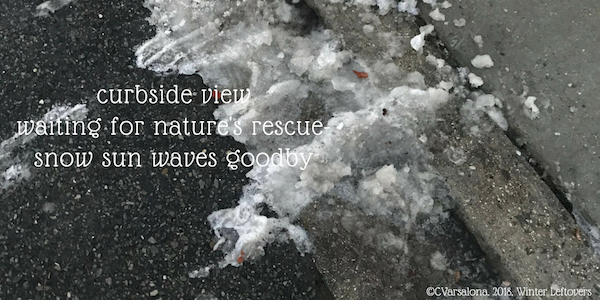 I received a beautiful photo poetry postcard from Mary Lee Hahn with one of her haikus that I am uploading to #WinterWonderland18 and a one word sticker (below). 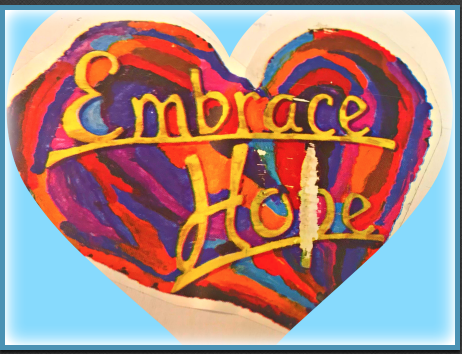 Michelle Kogan sent me her hand-drawn artistic poetry postcard with an additional poem to honor my one word, hope. her through our new year! Poetry is a gift that keeps on giving. Happy Poetry Friday! I am now going to open the site for those who live on the other side of the world. 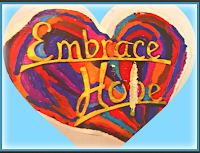 Thanks Mary Lee for the Embrace Hope sticker. or the glare of the sun showers land. 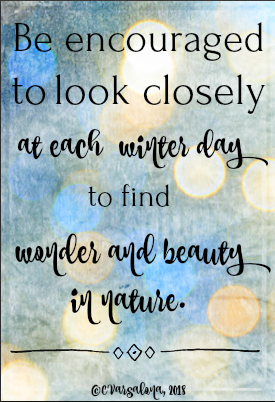 Whether you live in warm climates or snow-covered lands, winter is the time to tuck yourself in, uncover the layers of life, and hope for a year of blessings. the beauty of stilled wonders. 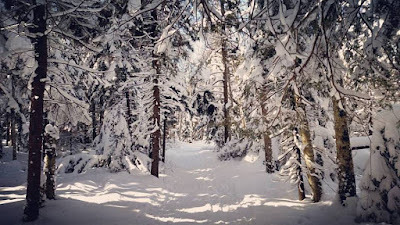 I invite you to discover nature's artistry this January and February in your locales where earth can be covered in winter white blankets or warmed by the sun's brilliance. 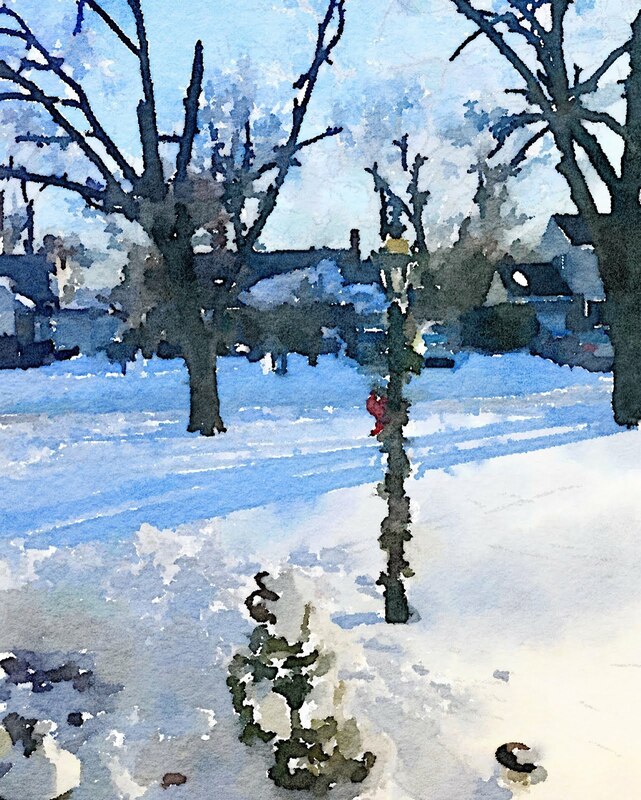 capture YOUR perspective of the winter season in any of these mediums: photographs, videos, digital slide shows, songs musical compositions, artistic renderings, collages, illustrations, digital inspirations, image poems, inspirational quotes, sketches, or hand-draw pictures. Share your inspirations globally. -Have proper credit for work displayed with the name of the author and location of the image embedded at the bottom of the image. 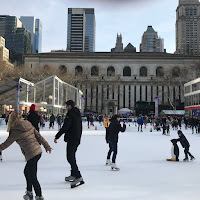 -Be sent in a thumbnail (jpeg or png) format, 450 pixels or no larger than a 3 by 5 image to my gmail account (cvarsalona at dot com) with the subject line Winter Wonderland Gallery. -Be placed in the repository on Twitter under the hashtag #WinterWonderland18 . -Be submitted by February 28, 2018. Let's spread joy and inspiration this winter season through this gallery of artistic expressions. Lady Winter, fashionista that she is, shed her layered white coat and added sunglasses to her attire this past weekend. 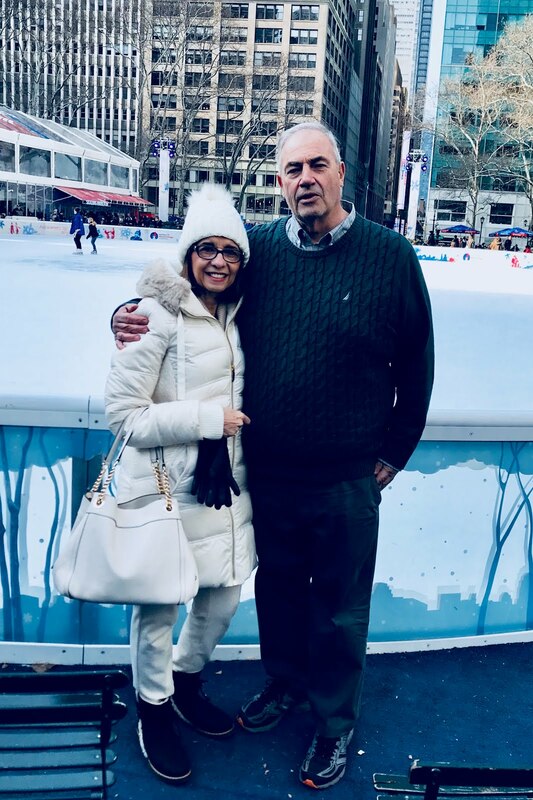 After all, temperatures were in the 40's, making Manhattan feel more like springtime than winter. When weather shifts in New York City, people take to the streets for Sunday strolls. Because of this, my family and I spontaneously shed our heavy coats and happily jumped in the car for a trip to Manhattan. The drive in from Long Island was an easy trip, no congestion on the road and traffic moving. As we neared "the city", the skyline was as clear as can be, making the sight a joyous one for me. When crossing into Manhattan, there was a vibrancy that sharpened my senses. Parking is usually not an easy task but luck was on our side. A spot opened up on the corner of 5th Avenue and 39th Street, across the street from one of my favorite stores. My first treat of the day was to stop to shop. Our little grandbaby reaped the results of that enjoyable venture. Next, we headed over to the public library with its magnificent Library Lions' sculpture greeting us. A huge banner for the new exhibit, Remembering the 60s, hung in front. As we approached ,another couple told us that the library was closed but not to worry, we stopped at one of the local street vendor carts that was selling hats. I just couldn't resist adding another white hat to my collection. Then, off we went to Bryant Park. The weather was as calm as a spring day heated by the sun. People milled around the carousel. Others walked at a leisurely pace. There was the usual hum of city life but in a more relaxed fashion. Since beeping is not allowed anymore, city noise was full of excited conversations not blaring car horn noise. Bryant Square was lively. Giddy, gleeful sounds emanated from children on the carousel. 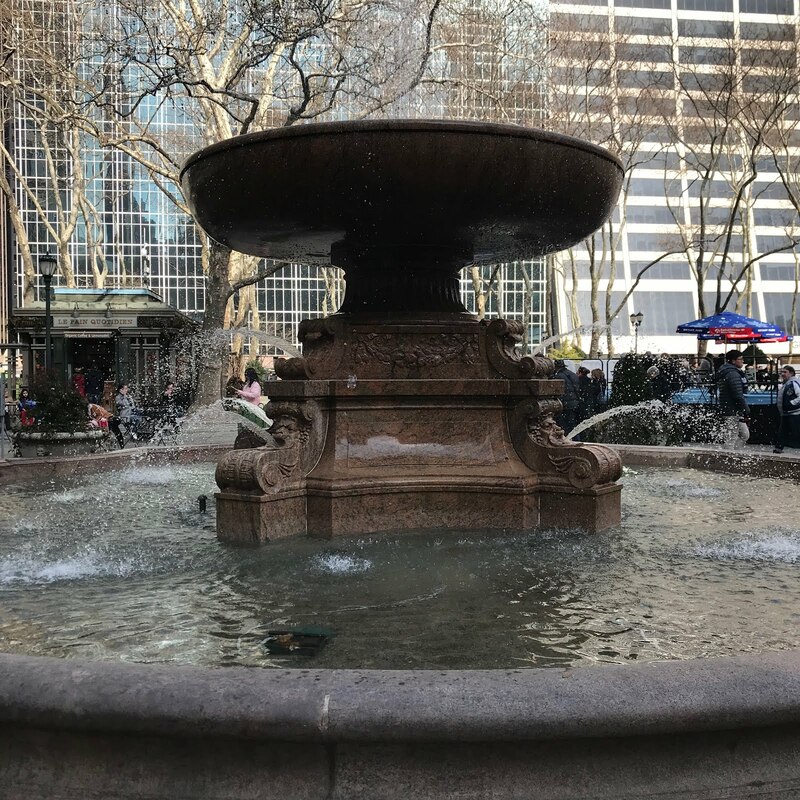 A huge water fountain in the middle of the square flowed with water. Skaters pranced around the ice in a circular fashion. 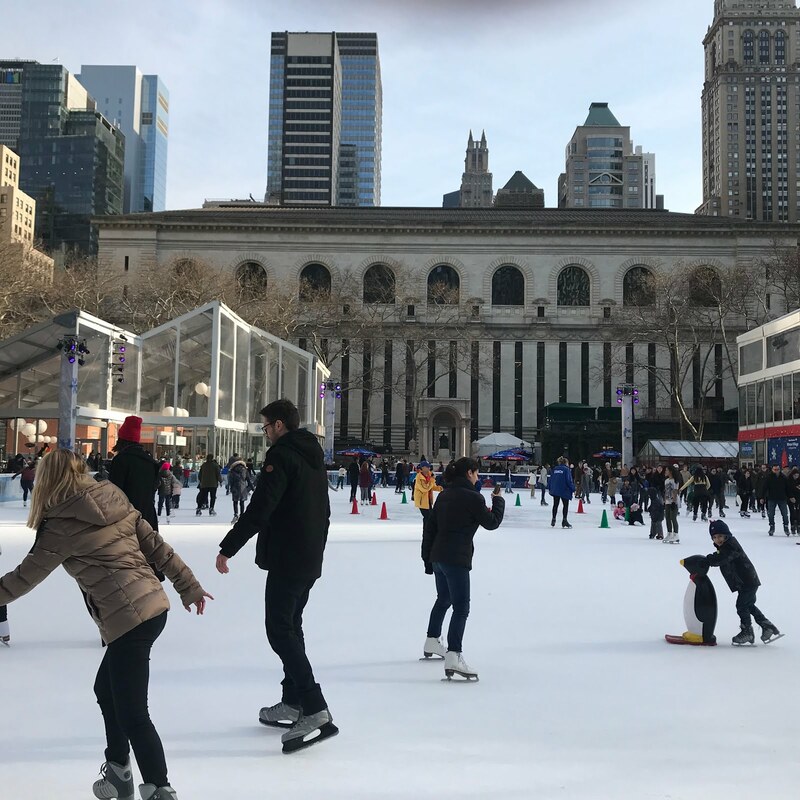 Music added liveliness to the scene where little ones with miniscule skates were gingerly led across the ice by parents. Smiles were on many faces, marking the day as a celebration of life and respite from the cold temperatures of early January. We rounded off our tour to Manhattan with a visit to Chinatown. There was much energy in the streets. Vendors displayed their goods and the smell of fish perfumed the air but the real action was in the congested park. Men and women congregated at separate tables, conversing and playing cards. I was fascinated by the gregarious nature of the players and the intense looks on some faces. In sharp contrast, the other end of the park was devoid of chatter. 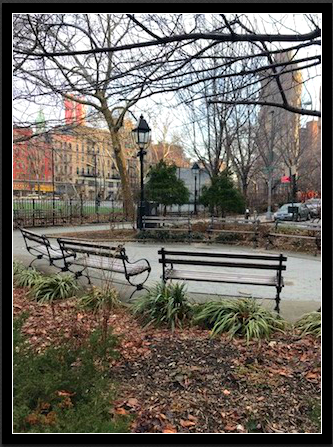 Benches invited all to sit and reflect upon city life in winter. After a delicious meal in Chinatown, the day drew to a close. Memories were made once again. 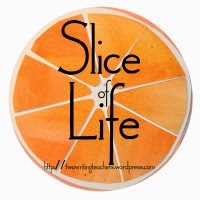 It's Slice of Life Tuesday at Two Writing Teachers. 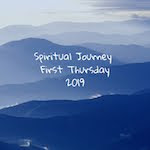 Join me as I head over to read others' thoughts. 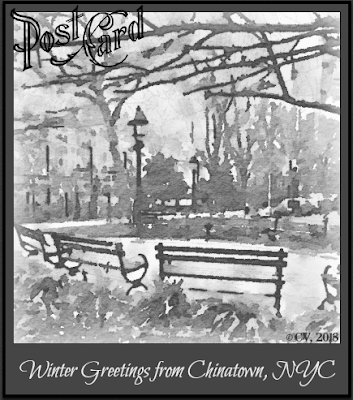 In the meantime, enjoy my winter postcard from Manhattan. Sitwell's quote reminds me that winter is the time of year for stepping back and enjoying the warmth of family and fremily togetherness. It is the time to look inside, enjoy moments of solitude but also the time to let JanYOUary shape our winter lives. Make the most of winter! It is our launching pad for one word goals to propel our 2018 dreams and hopes. 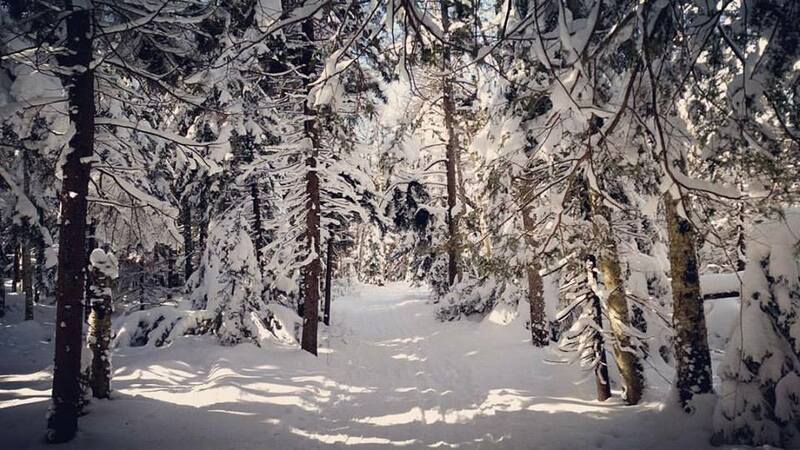 savor the beauty of untouched paths. life to hushed stillness and peace. Tomorrow, I look forward to a winter walk exploring Manhattan with my family. 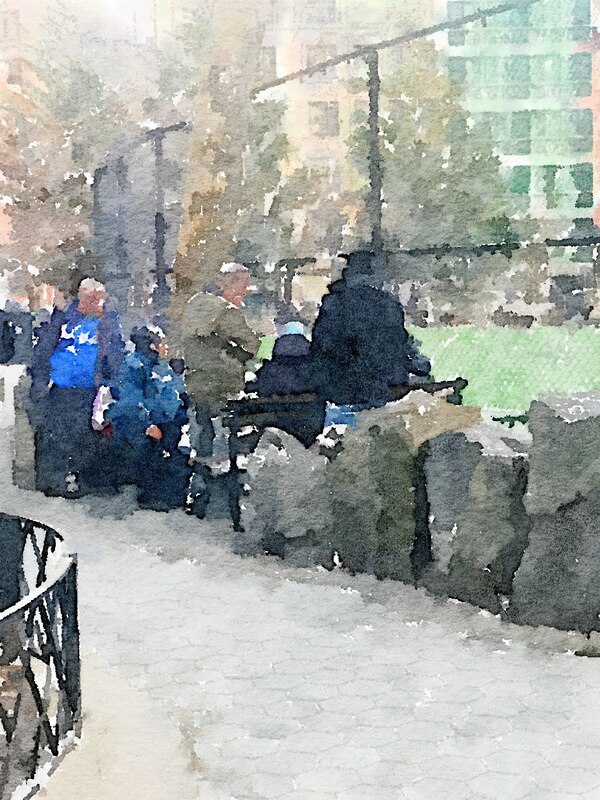 Who knows what sights and sounds I will find because New York City in winter is a happening. May your weekend be filled with winter magic and celebrations of life. I am off now to Celebrate This Week with Ruth Ayres and her community of writers. Join me. This week I will invite all to create alongside me for my newest gallery, Winter Wonderland. This is everyone's chance to voice positive thoughts about the season of winter, whatever it may look like in your locale. You can see some of the digitals that have been gathering for this year's winter gallery at #WinterWonderland18 and visit last year's winter gallery here. With the snowfall of last week a memory away, I leave the warmth of the yoga studio thinking how much easier it is to maneuver the walkways. The sound of the invocation of peace, "Om, shanti, shanti, shanti", replays in my mind and I feel calm and joyful, despite the cold weather. 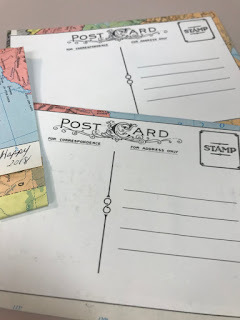 I hope to find a poetry postcard in my mailbox when I return home. 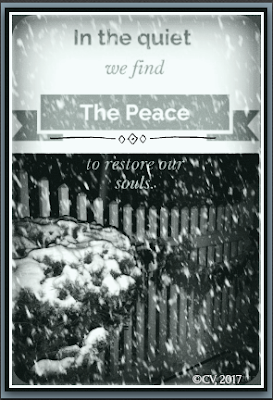 Thanks to the organizational efforts of fellow poet, Jone Rush MacCulloch, her Poetry Postcard exchange to usher in the new year with peaceful and joyful thoughts is thriving. I feel fortunate to receive some poetic messages from friends. 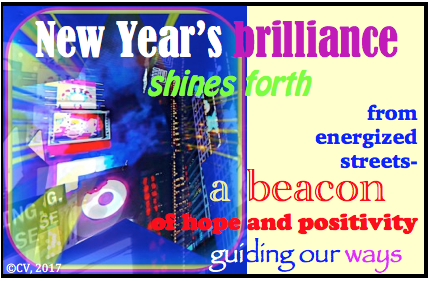 Since I am in the process of creating and sending my postcards out, I will share what I created last year. It is serendipitous that I found my 2017 postcard because I forgot that it holds my 2018 one word, hope, and a greeting of peace. 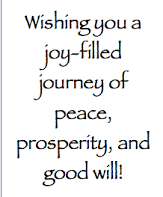 With joy, I share this week's poetic greetings from Linda Baie, Diane Mayr, and Christie Wyman. 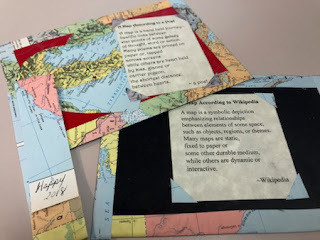 I shared Linda Mitchell's poetry postcards last week's Poetry Friday. Here is the link in case you missed it. 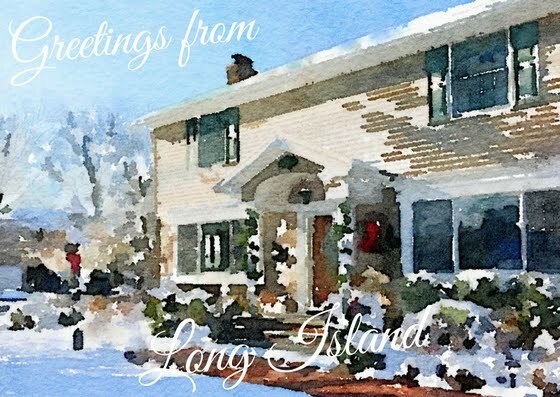 I hope you agree with me that these postcard greetings are poetic messages of joy. They brought such joyful feelings to me this winter and I am grateful. 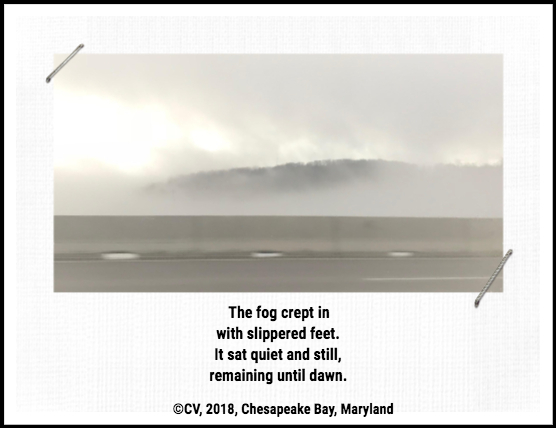 Kay McGriff, host of today's Poetry Friday Roundup, is also celebrating the arrival of her set of poetry postcards so be sure to stop by the Poetry Friday Roundup at her blog site. Celebrate the Words of Dr. Martin Luther King, Jr. The words of Martin Luther King, Jr. still ring true even though decades have passed. 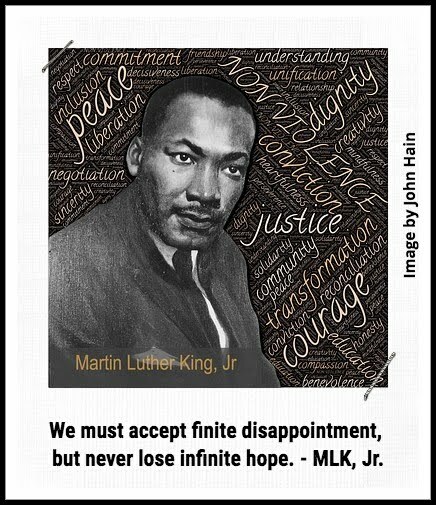 On this day of tribute, Martin Luther King, Jr. Day, a nation pays tribute to a man who held peace and hope in his heart and provided us with many inspirational thoughts. "With this faith we will be able to hew out of the mountain of despair the stone of hope. With this faith we will be able to transform the jangling discords of our nation into a beautiful symphony of brotherhood." Are we ready to hold that stone of hope in our hands, open the doors to positive discourse, unite as a brotherhood of peace, and never lose infinite hope? Are we ready to be change agents and messengers of kindness. Beside paying tribute to a great man of peace and non-violent interactions, we need to consider random acts of kindness this week as an alternative to "me" thinking. 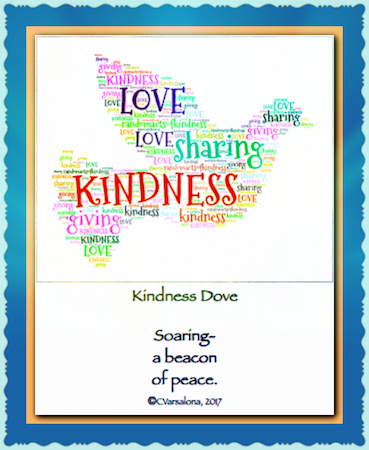 I am sending the Kindness Dove out around the globe to share the love of giving. Kindness leads to additional kindness. Let's stand in the shadows of Dr. Martin King, Jr., firm in our commitment, and quick in our conviction to be kind. I #choosekind! Do you? Celebrate the legacy of Dr. Martin Luther King, Jr. tonight! Oh my, where does my time go! I need my 2018 one word hope to rescue me because I am always a "day late and a dollar short". Time management seems to be on my immediate list of improvements for this year. When I received a package in the mail from Linda Mitchell, I was perplexed. 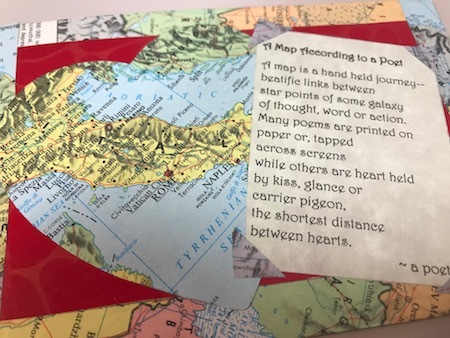 I know that I missed the Winter Poetry Swap that Tabatha Yeats initiated and I was not sure if I had the instructions for Jone MacCulloch's Poetry Postcard Exchange so Linda's package was a wonderful surprise. Her swap centers around the theme of journey and travel. The map in the background was of Italy. Little did Linda know that Italy has been a long-standing dream place to travel to with my family so how serendipitous this is! Maybe my #oneword2018 will fulfill my wish at some time in the future. 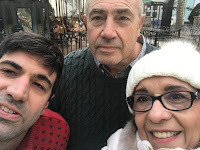 For the present, Google Maps and Waze are doing a wonderful job of getting me from Long Island to Reston, Virginia for my awaited visits with my granbaby. 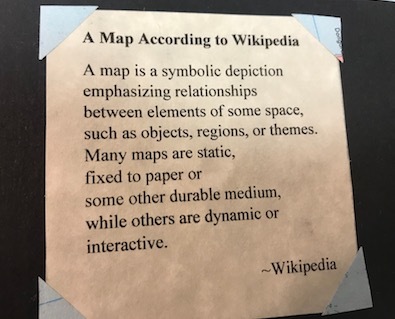 Getting back to the map poem -- another interesting point about the map theme is that Linda lives in Virginia and I plan to map out how far her home is from my daughter's. Perhaps, there will be a meet-up in the summer when I am in Virginia. Now, I am ready to take a closer look at what was sent in the package. Linda's postcards remind me of the early 20th century cards etched on wood. They are durable. They have corner tabs as were common in the 1940s-50s. star points of some galaxy of thought, word, or action." Ah, reading that opening put me in a happy state which may have been the point. While the next few lines bring me back to reality with an informational piece, the words "heart held" and the ending words, "between hearts", took me back to a wondering state of bliss. I thank Linda for her craft project and research that produced two interesting poems that filled my heart with joy. 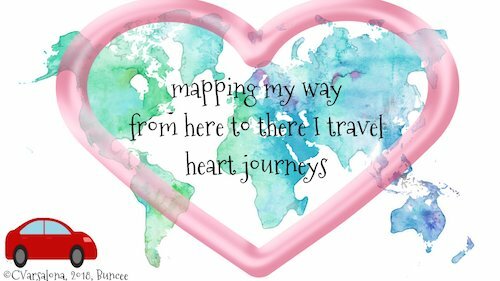 I am now hoping for a year of wonder-filled travels wherever they may be. To see the animated version of this Buncee go togoo.gl/WhZn8L. It is Poetry Friday time and my colleague, Jan at Bookseedstudio, is hosting. I am off to see what she has in store for the poetry roundup. but there may another storm on its way. It's snow slush time once again. It has been several days of frozen temperatures after the snowstorm but today the weather is milder. 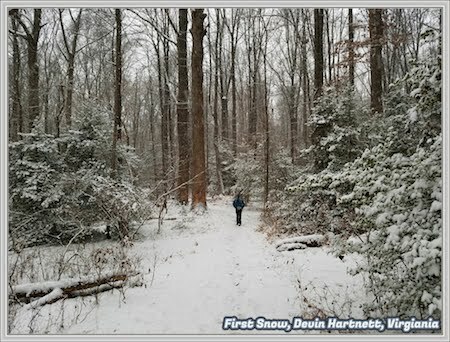 The white pristine snow glistens under the gaze of the snow sun and softens before my eyes. Thinking that the melted snow will help speed up the snow removal task, I whisk the shovel around, aggressively break up the piled snow. I watch as the snow tumbles and takes a plunge into a puddled area. A new color arises. 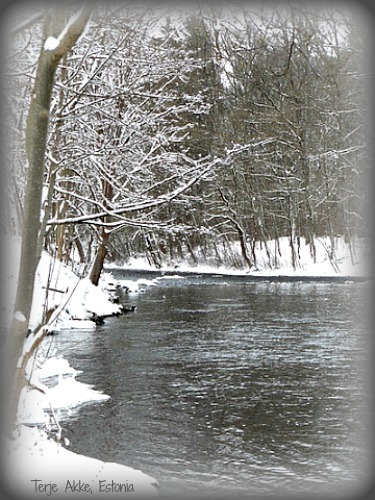 Murky grey water mixes with pure white snow and snow slush is created. 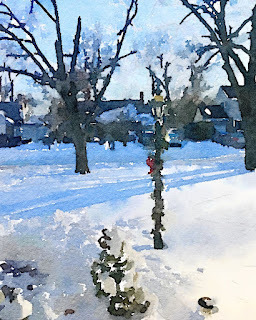 While it is not appealing to look at, the snow slush reminds me of the holidays when I mix colors for cake frosting. A little of this and a little of that makes for a strong visual presentation. So too, in my driveway, I experiment to find the right mixture. I carefully take another snow shovel scoop of pure white snow and blend it with a dose of tread-upon snow. I add in some melted water and wait for a new and exciting blend to make the snow shoveling routine a brighter shade of grey. While this does not work, I am able to carve out a nice path to the left of the house while the men tackle the right side. Then, I quietly return indoors to wait for nature to take its course.